It’s Thanksgiving week. It’s also Civil War week. It’s the 119th Civil War. It’s also probably going to be one of the most lopsided Civil War games in a long time. This isn’t a knock on the Beavers. They have a first year coach, no experience at quarterback, and Oregon is playing as well as any team in the country. 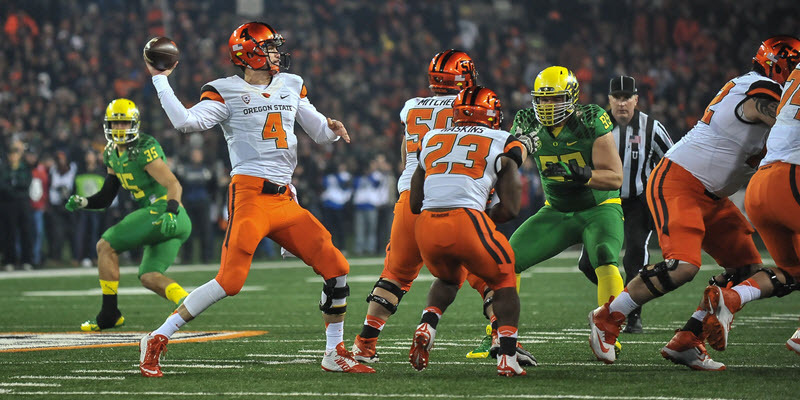 The Beavers have a lot of potential in the coming years, just not this year. The Beavers’ starting quarterback at the beginning of the season, Seth Collins, was injured in Week 8, and now may return this week as a receiver. Taking his place at quarterback have been freshmen Nick Mitchell and Marcus McMaryion. McMaryion has been announced the starter for this week. All of these quarterbacks are dual threat and need to be contained, as you will see in this play. The left defensive end is the read man. 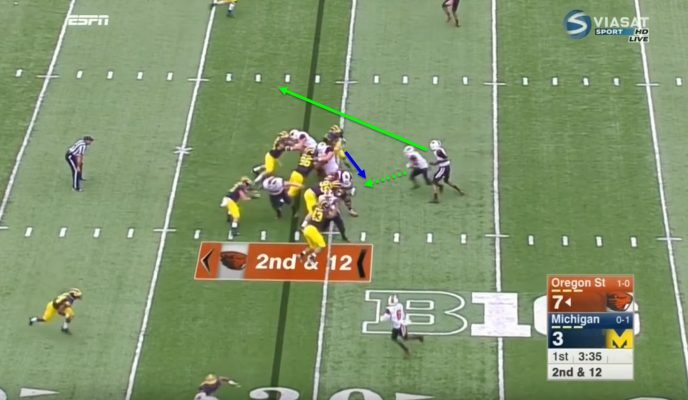 As you can see in the screenshot above, the Beavers are lined up in a standard three-receiver set, with the quarterback in the shotgun. 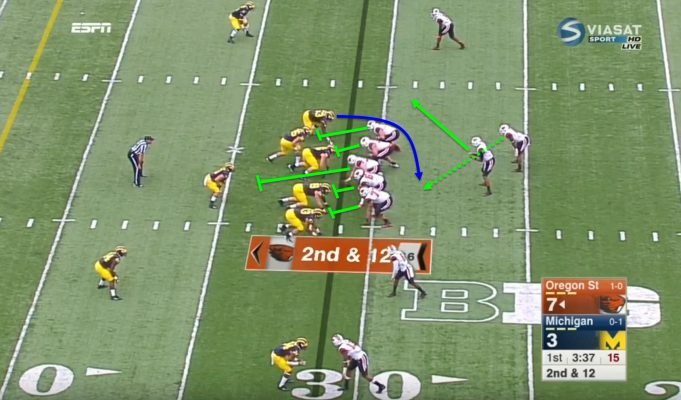 The Wolverines, lined up across from them, are in a 4-3, with one of the linebackers in coverage. The defensive end doesn’t stay home, making it a very easy read for the quarterback. 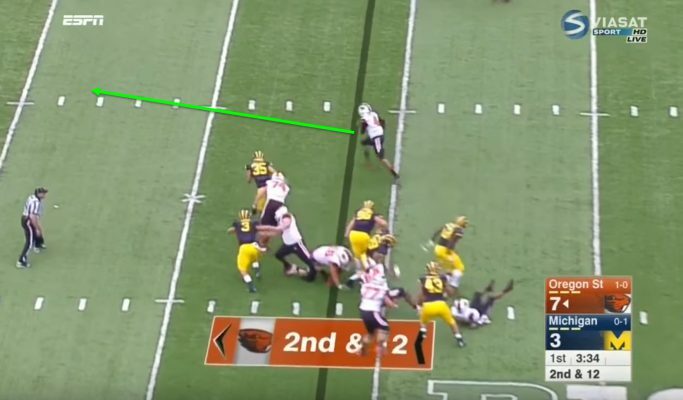 At the snap, the Beaver offensive line is going to block whoever is in front of them, leaving the left defensive end to be the read man. The Beaver quarterback is reading the left defensive end. Foolishly, the end leaves his assignment. I think my 10-year-old cousin could have gotten a first down on this play. As you can tell, the quarterback has all the space in the world to use his remarkable speed to make a big gain. The Oregon State quarterbacks have great speed and need to be contained. The Ducks defense is going to have to make sure not to overcommit and to stay on their assignments. This shouldn’t be too hard for a team who faces the read option every week. Watch the linebackers, they will be pulled out of the play. This next play is something you should see a lot tomorrow with a young, struggling quarterback at the helm. 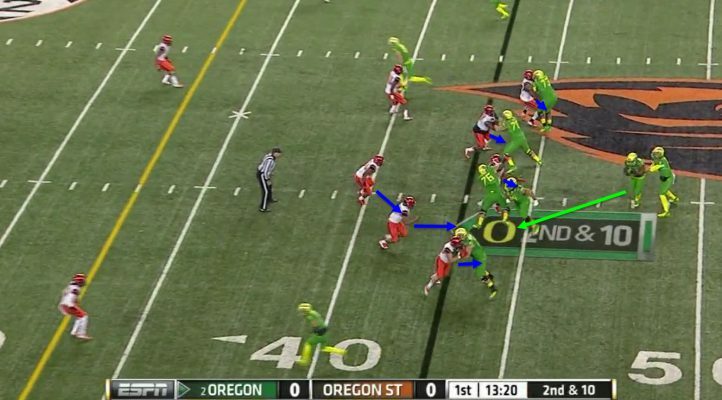 As you can see in the screenshot above, the Beavers are lined up in a two-tight end, two-receiver set. The defense is lined up in a 4-3 defense again. The play-action fake pulls the linebackers toward the line of scrimmage. 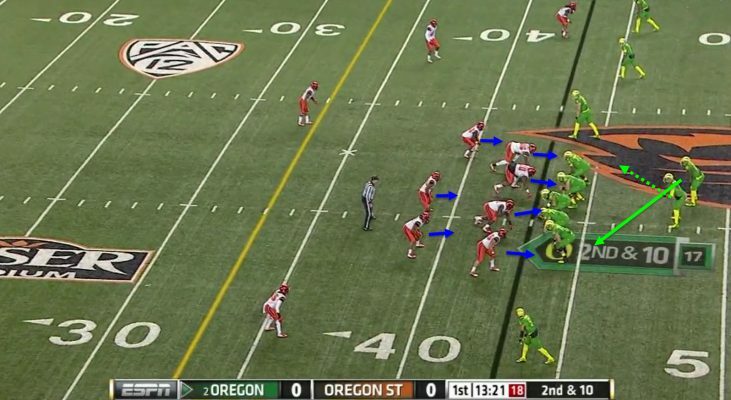 At the snap, the Beavers are going to fake the dive run. The Wolverine defense bites on the fake. 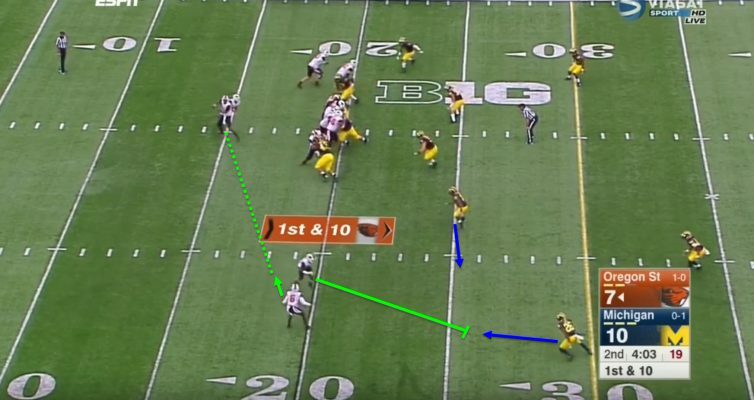 This leaves the linebackers at a huge disadvantage to stopping the screen to the receiver. The quarterback turns and quickly fires it to the receiver. Bolden in space is a dangerous sight. Let’s hope that doesn’t happen tomorrow. The defensive backs are playing far off the line of scrimmage. 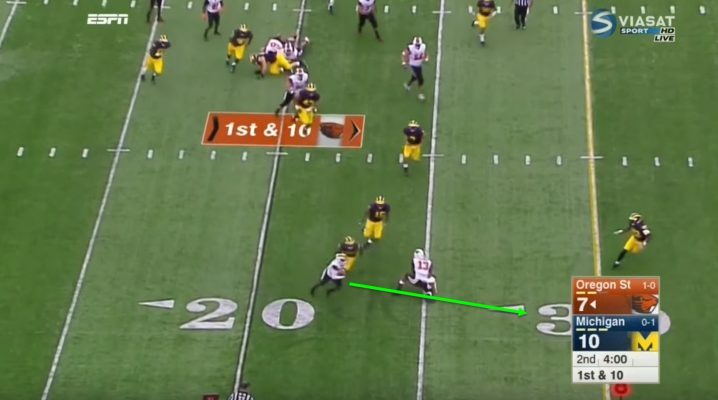 So, when the receiver gets the ball, he has a ton of room to run. With plenty of space available, Bolden makes a big gain. The Ducks need to watch out for Beavers’ receiver Victor Bolden. He is a speedster and a playmaker. They will get him the ball on sweeps, screens, slants, deep post/go routes, and any other way possible. He must be contained, just like the quarterbacks. Speaking of defense, the Beavers’ defense has been struggling as much as the Ducks defense has, giving up 35.6 points per game. So, let’s take a look at how they will try to stop the Ducks. The Beavers defense relies on its linebackers to make plays. 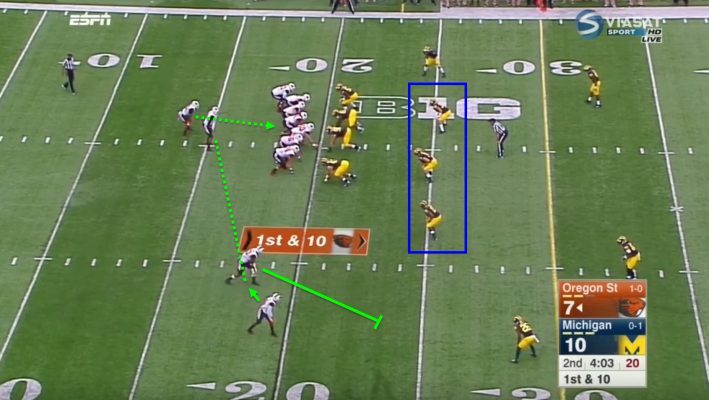 As you see, the Beavers are lined up in a 4-3 defense across from the Ducks offense, who are lined up in a four-receiver set with the quarterback in the gun. The defensive line stays home to force the quarterback to make a hard decision. At the snap, the Beavers’ defensive line is all staying home. This means that they are not going to get into the backfield much in order to force the quarterback to make a decision on whether to keep it or hand it off. The linebackers are the strength of the Beaver defense, so the goal is going to be to free them up to make plays. The running back has nowhere to go, and runs into the awaiting linebackers. The defensive line is able to swallow up the blocks and allow the linebackers to be free to roam. If they make a tackle, nine out of 10 times the result is a tackle for a small gain. 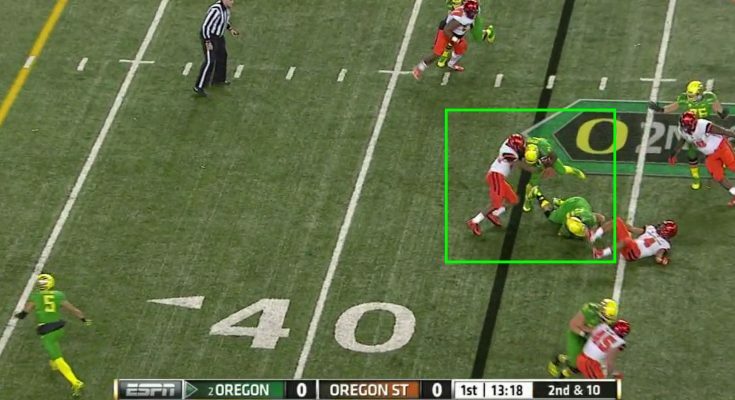 If the Beavers can’t make tackles like these, the Ducks may put up 70 points. There is nothing special to what they do, but they execute it so well that it works. This game is going to be a blowout. This is a rebuilding year for the Beavers. In the next two or three years, I would not be surprised if this team is contending for Pac-12 titles with the talent they have. Just not this year. The only way this game goes the Beavers’ way is if Bolden and the McMaryion have the games of their career and the Ducks sustain some big injuries. Again, I really mean no disrespect to the school up North; the Ducks are just playing some of the best football in the country, and the Beavers are not. Ducks roll, 55-17.